William Butler Ogden was born in upstate New York in 1805. His family was in the real estate business. He became active in Democratic politics and was elected to the New York legislature in 1834. A year later he made a trip west to look over some land his family had bought. The location was a new town named Chicago. Though Ogden didn’t think much of the grubby little village at first, he quickly sold off part of the property at a nice profit. That got Will Ogden interested. He decided to stay in Chicago as a real estate trader. The economy was booming and he got rich. He became one of the town’s leading citizens. Chicago was formally incorporated as a city on March 4, 1837. Now there would be an election for a mayor and city council. The local Democrats named Ogden as their mayoral candidate. 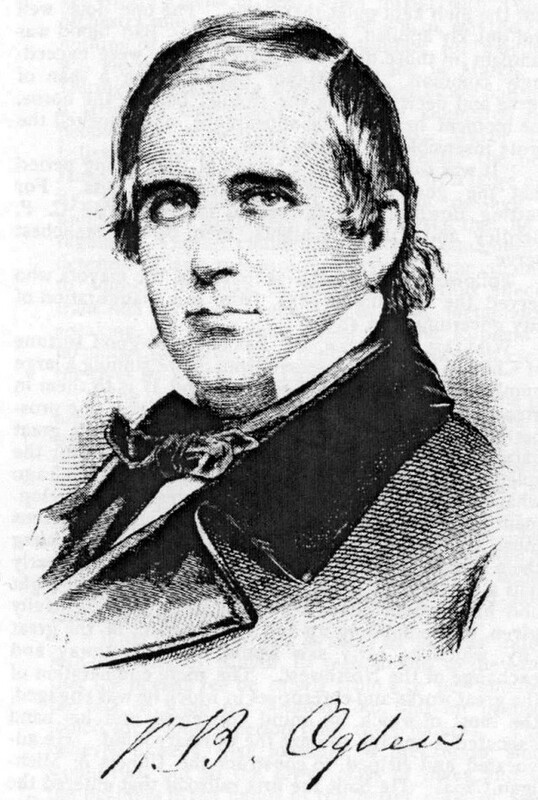 The Whig Party picked John Harris Kinzie. Though Kinzie came from a popular pioneer family, Ogden easily won, 489-217. Ogden served a term of ten months. He appointed a board of health, held an election for school inspectors, and ordered the city’s first census–which revealed that Chicago had a population of 4,170. In Ogden’s time, political office was a public service, not a profession. Chicago’s first mayor refused to run for re-election. He went back to doing what he did best, being a businessman. And he was involved in everything. Ogden designed the first swing bridge over the Chicago River. He dug a channel to straighten out the north branch of the river, creating Goose Island. He bought and sold land. He backed construction of the Illinois and Michigan Canal. In 1848 he built Chicago’s first railroad. He made money on all these projects, of course. That didn’t bother the public. Ogden had a reputation for fair dealing. He also “gave back” to society–the city’s first medical school was built on land he donated. During the 1850s Ogden broke with the Democrats and joined the anti-slavery Republicans. As a Republican he was elected to the state senate. Ogden knew Abraham Lincoln through business, and actively supported him for president. Railroads were now Ogden’s main activity. In 1862 he became president of the new Union Pacific Railroad, which was constructing the world’s first transcontinental line. He kept a residence in Chicago, but was spending more and more time in the East. He was in New York in 1871 when word of the Great Fire reached him. He returned to Chicago to find his mansion and its priceless contents destroyed. Ironically, his brother’s nearby home was one of the few buildings that survived. Ogden was briefly engaged as a young man. He remained a bachelor until shortly before his 70th birthday, when he married a lady twenty years his junior. According to friends, the couple had been in a relationship for nearly three decades. 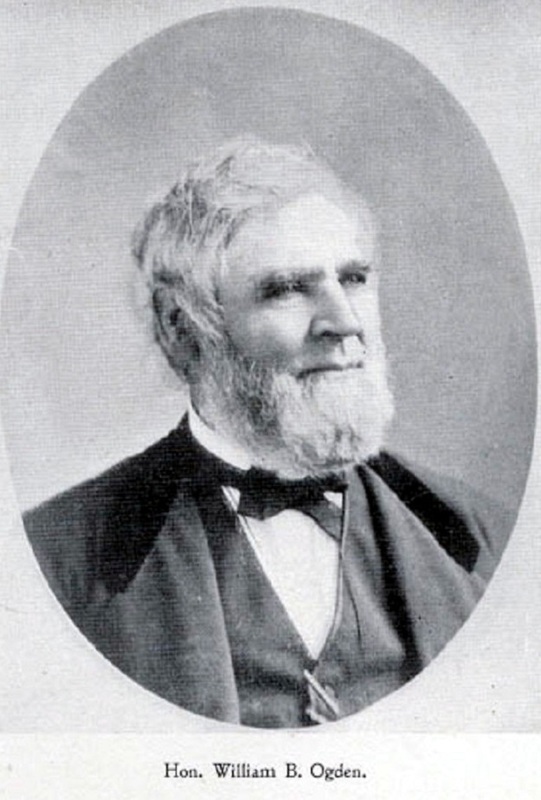 William Butler Ogden died in New York in 1877. He is buried in Woodlawn Cemetery in The Bronx.